In the opening match, Berlin downed the Rheinland Lions by a huge 121 points before winning the next match against the Giants by an equally impressive 74 points. In the third men’s match, the Rheinland Lions defeated the Zuffenhausen Giants by 21 points to get their season started with a win and a loss. The next round will be played with two round robins in the south of Germany. In Stuttgart, the Zuffenhausen Giants will host both the Crocs and the Hamburg Dockers. In Munich, the Kangaroos will play host to the Frankfurt Redbacks and the Dresden Wolves. The Lions will have the bye. 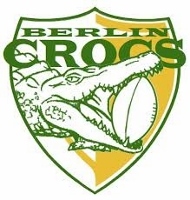 The round will also see the inaugural AFLGW competition swing into action in Stuttgart with the local Southern Tigeroos taking on the Berlin Crocs. The four-team competition also includes the Hamburg Dockers and the Rhein-Main Redcats (centred around the Frankfurt metropolitan areas as well as the Rhine and Main Rivers). 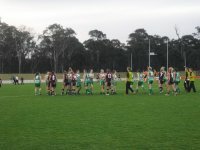 The Southern Tigeroos are an amalgam of players from the regions surrounding Stuttgart and Munich.